Having decided that it was time I changed my silica sand substrate for something better I looked around at the options available. 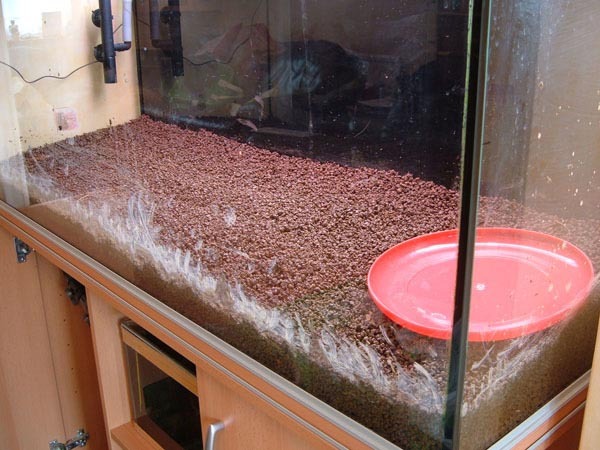 For my 200 litre tank I was going to need a fair amount of substrate and all the commercially available ones would cost me a fortune for the amount that I required. Tom Barr recently published an article where he tested several different substrates growing Myriophyllum spicatum (spiked water-milfoil). The results were quite astonishing, and I quote from the article "SMS had the highest total growth, followed by sand and potting soil, then Delta sediments. ADA and Lake Tahoe sediments had the lowest total growth other than the sand which acts as a non nutrient control". OK this was only one experiment using only one type of plant, but even so the results were very positive towards the SMS. SMS stands for Soil Master Select and is a baked clay that is used as a soil improver due to it's water retention properties. In the States I know of a lot of people who use SMS as a substrate very successfully, but unfortunately it is not available here in the UK. The hunt was on for something that was very similar, easily available and cheap. 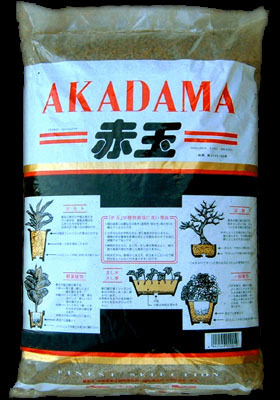 A product called Akadama that is used by Bonsai growers caught my attention. 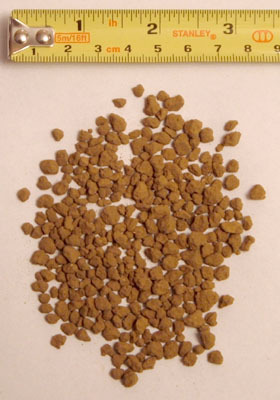 This is a baked clay that should have similar properties to SMS. There are different grades of Akadama so had to try out different ones. The best one I found is called Double Red Line Hard Quality and has a very good grain size of 0-6mm. There is also a finer grain size variety of 0-3mm called Shohin Double Red Line Hard Quality, but this I thought was a bit fine for my needs. The name Akadama comes from the Japanese words for red and ball. It is a volcanic clay that is mined from a depth of about three meters from old Japanese Cryptomeria forests. The deeper it is mined the harder it becomes. It is then dried and baked to remove any organic matter and diseases. Finally it is crushed, sieved and graded into different particle sizes and then bagged up. It is used by many bonsai growers for its ability to retain water and nutrients while still providing porosity and free drainage. When wet it darkens making it easy to see when it has dried out which is a useful benefit for growers. Akadama has a very good CEC (Cation Exchange Capacity) value which means that it will pull out of the water any cations, eg Mg++, Ca++, K+, etc and hold onto these making them available for the plant's roots. The Akadama works similar to a cation exchange resin used in domestic water systems for softening water except rather than exchange magnesium and calcium for sodium ions, it exchanges magnesium, calcium, etc for hydrogen ions. The exchanged hydrogen ions then react with any bicarbonates in the water causing the KH and pH to drop. Also due to magnesium and calcium being held by the Akadama the GH will drop as well. 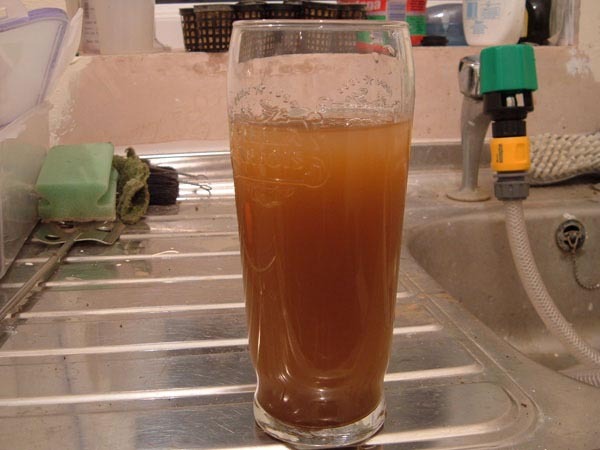 After a period of time and a few water changes the water parameters will settle down. 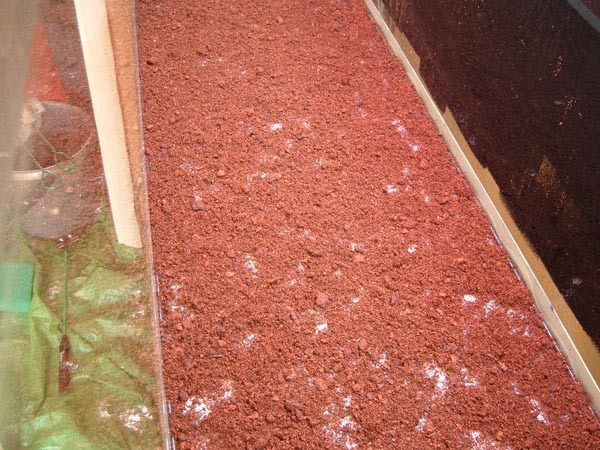 Being a baked clay Akadama is very porous which means that there should be very good water circulation through the substrate helping prevent any dead spots and providing plant roots with nutrients. I would advise anyone wishing to try this substrate to purchase the Akadama in the picture above. Some Akadama's are very soft and crumble easily. The one drawback is that the Akadama when bagged up is very dusty and will require a lot of rinsing. You now have two choices. If you are not concerned about the KH dropping sharply then the Akadama can just be placed straight in the tank and used straight away. It is advisable to do very regular large water changes to dampen the KH changes. It took two weeks of almost daily water changes until my tank settled down. The other choice is to pre-treat the Akadama with a strong GH solution to speed up this process out of the tank. After a week soaking, rinse well and use in the tank. Any KH drop should now be minimised. 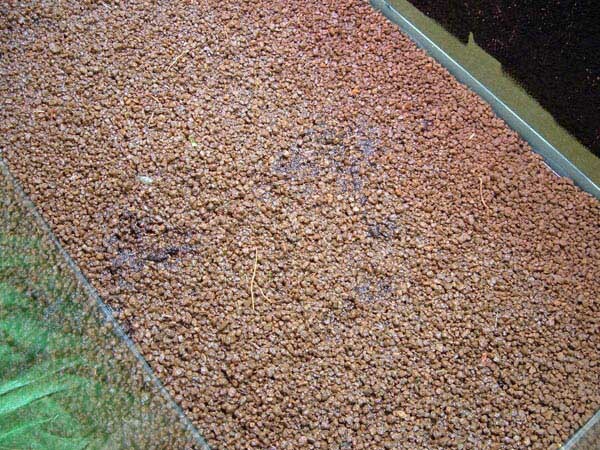 Other ideas are to place some mulm from a mature filter or substrate in the bottom of the tank before the Akadama goes in. This will help kick start the substrate with bacteria and make it mature quicker. 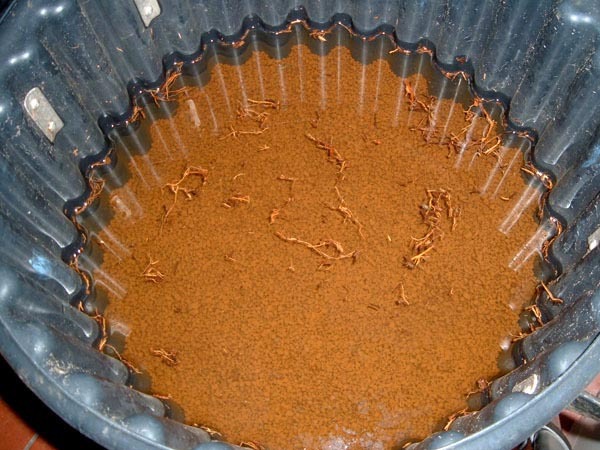 A scattering of peat in the bottom will provide favourable conditions for bacteria and the plant's roots. Also a scattering of Osmocote in the bottom will provide nutrients in a slow release capsule. Some or all of these can be used. This will give you the volume of substrate in litres. Divide this figure by 14 to obtain number of bags required. I decided that because I had loads of shrimp and some fish I'd pre treat the Akadama to prevent the KH from dropping which is common with baked clay substrates. 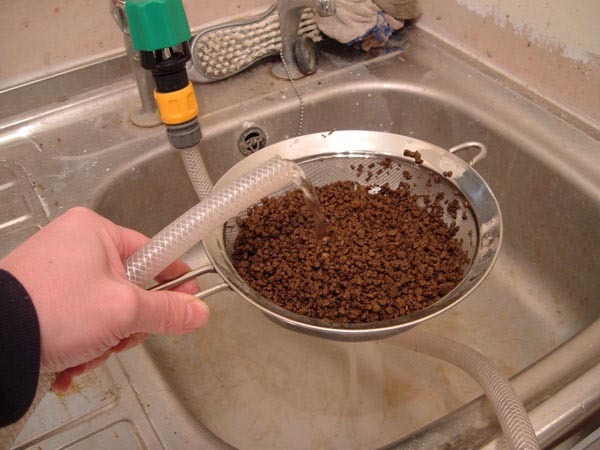 If you plan on setting up a new tank with no livestock for a while, then the pre-treating could be skipped. 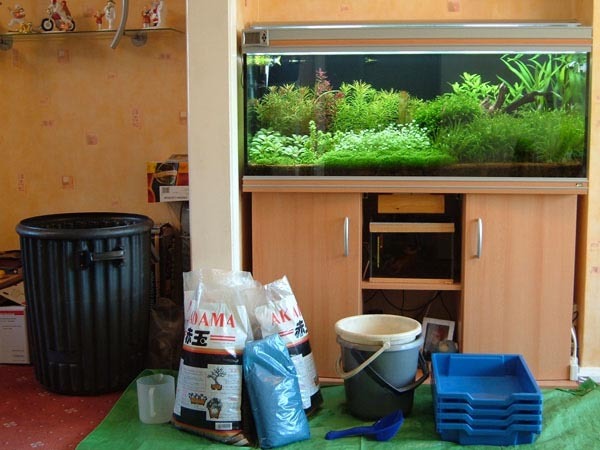 This solution was then added along with more water to completely cover the Akadama and left for one week. Makes a lovely red brown coloured water. Settles to look like this. The stuff floating on top are small roots that must be dug up with the Akadama. As it's all baked they are perfectly safe. Smells a bit earthy as well. After a week the Akadama was rinsed really well. Easiest way I found was to use a kitchen sieve under tap water. I put the rinsed Akadama back in the bags for storage. This is what the water is like when rinsing. Everything is now ready. Bin to put fish in. Three bags rinsed Akadama. Small bag of sphagnum moss peat. Gravel scoop. Buckets. Trays to put plants in. Fish and shrimp removed. Removing old substrate. This scoop I brought from Aqua Essentials is really good as it has holes in it to let the water out and makes life easy. Surprisingly the old substrate wasn't that dirty and had no signs of black anaerobic patches. Notice the BGA that had grown along the glass in the substrate. 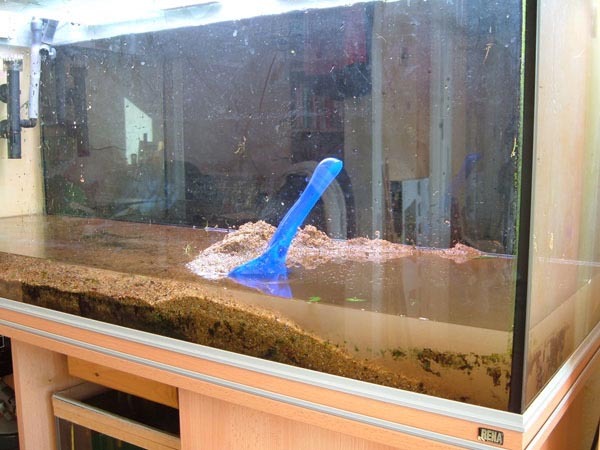 After the tank was emptied and cleaned it was time for the substrate to go in. But first I covered the base on the tank in a thin layer of sphagnum moss peat. It should be just thick enough so you can see the glass still. On top of this I added about a half inch of Akadama. This is to prevent the peat from being disturbed when the mulm is added. Cleaned the filter out to collect as much mulm as possible. This was then spread evenly over the thin layer of Akadama. The rest of the Akadama was now added. Approx 2.5 inches deep at the front and 3.5 inches deep at the back. About a quarter of a bag was left so my guesswork was fairly close. Frisbee is great for adding water and not disturbing substrate. Partially filled. Added wood and planted up. Planting was a lot easier than I thought it would be. I was expecting lots of floating plants, but it turned not a single plant came loose. Filled to the top. Fish and shrimp returned. Had a cup of tea and then took this photo. Clarity not too bad. Took me most of the day to do this but can now say it was well worth it. The new Akadama substrate is much better than the silica sand IMHO. 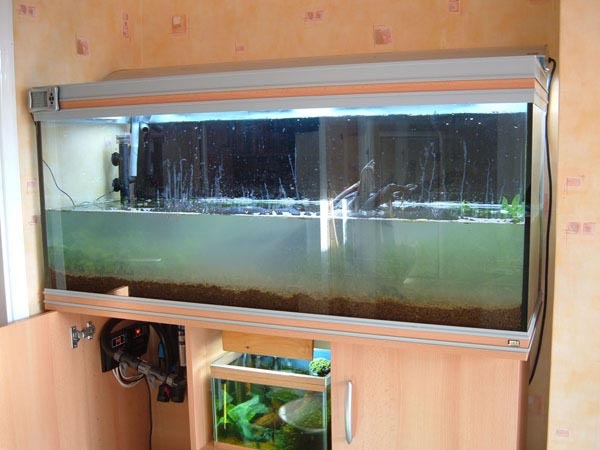 Next day the water in the tank was crystal clear, even looking along the whole four foot length. I did some GH and KH tests on the water to see how the parameters would change. The water that was added has a KH of 3.3 and GH of 5.6. After a few hours KH=3.3 and GH=11.2. GH was a lot higher than expected. Most likely because the Akadama wasn't rinsed properly after it's pre-treatment. After 24 hours KH=3.3 and GH=13.4. GH has risen a bit. Nothing too much to worry about as it's KH that I'm more concerned with. The KH has remained steady which was my aim and which so far has worked. Going to see what it is like at the end of the week now. Water changes will bring the GH back down to normal levels in time. I'm now thinking that perhaps my pre-treatment amounts were too high. They were a guess anyway. Perhaps cutting the amounts in half would work fine. How well does it work is a good question and one I can't truthfully answer. All I know is that it is better than using my silica sand, especially with the crypts which I never had a great deal of success with before. 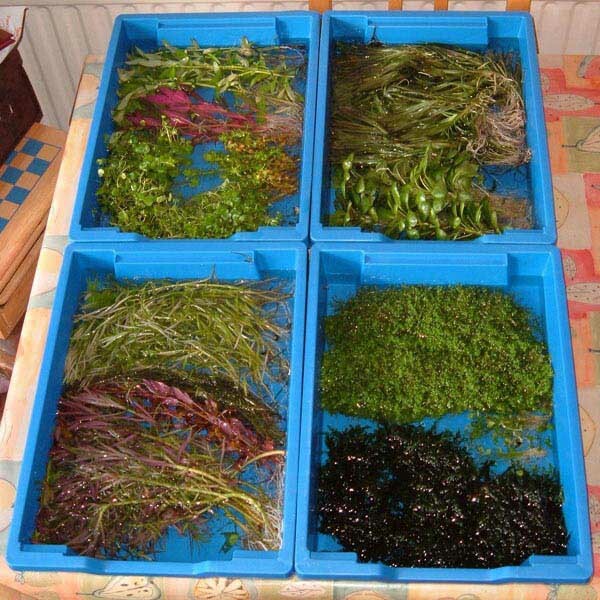 As the substrate is fairly nutrient free to start with it is best suited with a water column dosing method such as Estimative Index or PMDD + PO4. Even though it is graded 0-6mm I have found that most of the particles are in the 3-4mm region with only a few larger ones around the 6mm mark, as can be seen in the photo above. This to me is almost perfect. I've been testing this substrate for over a year now and so far it's been great, but I have noticed that when disturbing the substrate there is a small amount of 'dust' produced. It is recommended not to place heavy objects like large pieces of slate or rock on top of it as it may become crushed. 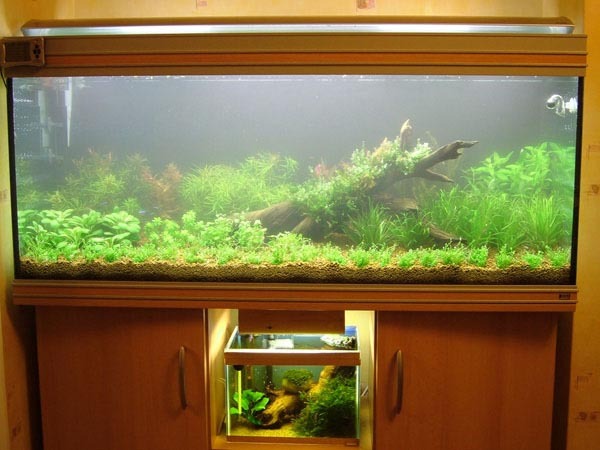 Anyone who has Amano's Nature Aquarium books may have already noticed that he uses Akadama in quite a few of his early tanks before he switched over to Aqua Soil. I only noticed this after I had started to use it. And finally how much does it cost? Each 14 litre (~10KG) bag cost me £6.50 from my local bonsai dealer.